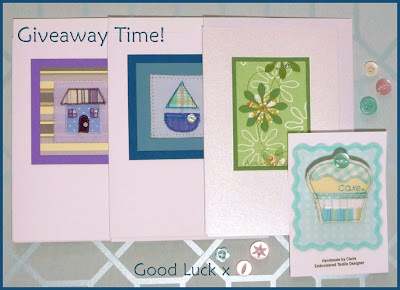 I have a giveaway competition running on my Facebook fan page to celebrate reaching 200 fans. For the chance to take part simply pop over to my fan page and leave a comment on the competition post letting me know what your favourite product is from my shops. I shall randomly select a winner next Wednesday. The prize on offer is a selection of handmade greetings cards, a handmade fabric cupcake brooch and a surprise Easter treat. I have had a lovely sunshiney afternoon designing and making a new product for my shops. 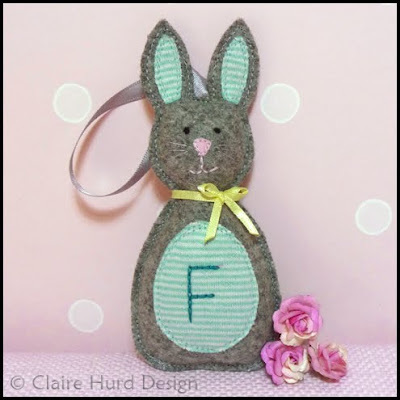 This cute little personalised hanging bunny decoration would make a great Easter gift or a unique keepsake to welcome a new baby in to the world. 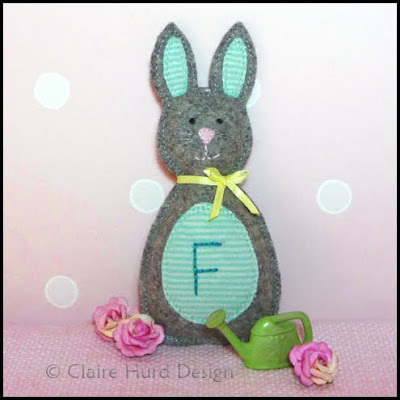 The bunny is made from soft grey wool felt and has a fine cotton knit aqua stripe tummy and ears. Take a peek behind and you will see a matching striped bunny tail. The features have been hand-sewn and the hand-tied bow has been secured with a few stitches. The bunny measures approx. 13.5cm tall and has an 8cm hanging loop. 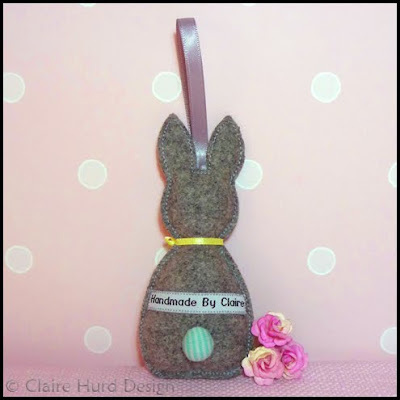 To purchase your very own little happy bunny please click HERE. I have almost reached 200 fans on my Facebook fan page! As soon as I do I shall be celebrating with a giveaway open to all of my Facebook fans. If you are not already a fan please join me here to keep up to date with all of my latest design work and for a chance to be entered in to my celebratory giveaway. I have just added a new Easter card design to my online shops. 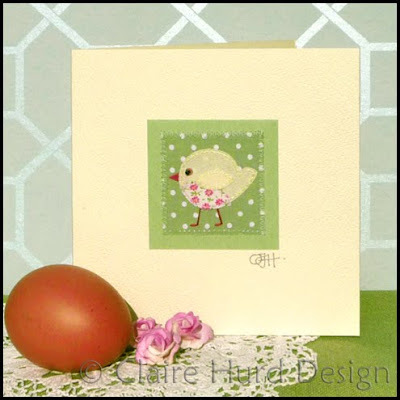 The card features a cute little Easter chick delicately appliquéd in springtime cotton fabrics. The little chick has hand-embroidered legs and a tiny sequin and bead eye. 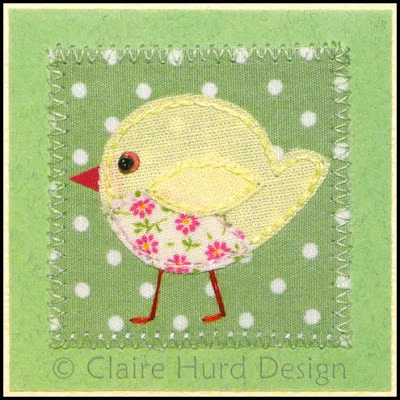 The chick has been appliquéd on to a pretty green spot fabric which has then been stitched on to a co-ordinating green textured paper. This has all then been applied to a pretty lemon yellow textured card base and has been signed. This card measures approx. 12.5cm x 12.5cm and comes cellophane wrapped with a matching lemon yellow envelope. The card has been left blank for your own personal Easter message. Please visit my online shop to purchase this card at either Folksy or Not on the Highstreet. New Design Now Available in M&Co. Last year I did a freelance project with M&Co creating design artworks to be produced as printed textiles for their home department. 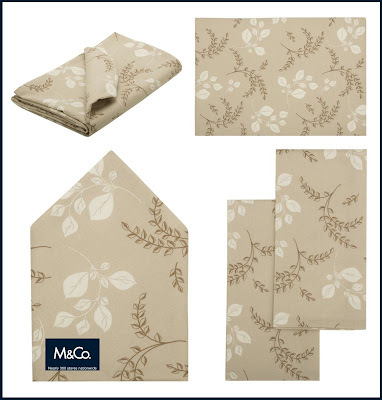 My leaf print design is now part of their Spring/Summer range and is available as tea towels, table cloths, napkins, placemats and seat pads. 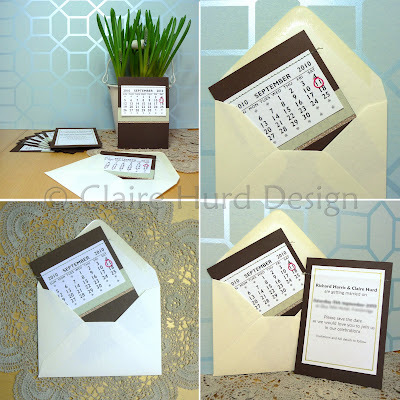 Alongside my 'Claire Hurd Design' work I am also currently organising our wedding. I want to be able to make it a truly personal wedding and am adding my own creative touches wherever I can. My latest achievement is to have completed all of our 'Save the Date' cards. I used a calender page in the style of those that we used to use at school when making Christmas presents for our parents! My Fiancé and I had seen them in a craft store before Christmas and were reminiscing about how much we enjoyed using them as children. We decided that they would work really well for our cards.